Christmas Traditions was the theme for Christmas At The Cottage 2013 in the Dining Room. 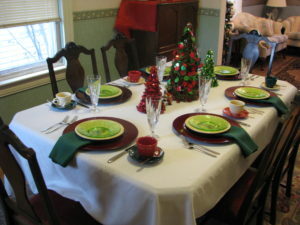 Using the traditional red and green theme, a hemstitched tablecloth made for a snowy-white base (Walmart), paired with green “laurel” napkins (K-mart). Glittery red chargers added a pop of flash (C. M. Russell Museum, Great Falls). Fiesta’s Christmas Tree luncheon plates (Herberger’s) served the main course, while slightly-smaller Depression green luncheon plates held a delicious salad (thrift store). Tea cups and saucers in alternating Fiesta Ivory (new), Scarlet and Evergreen match the colors in the Christmas Tree plates perfectly, of course! (Herberger’s), and water was served in elegant lead crystal flutes of unknown manufacture (thrift store). Reed and Barton’s exact reproduction of flatware found in steerage on the Titanic was the flatware pattern I chose; it has a little star on the handle, perfect for the season. The centerpiece consisted of simple tinsel-y cone trees in solid red, solid green, and a combination of the two, and Grandma O’s charming Santas and musical girls from the 1940s.